Dead Space: Hope You Enjoy Lots Of Blood! I got some hands-on time with Dead Space after going through their No Known Survivors site yesterday. I was pretty excited to finally try this damn game out. After all, I enjoy horror/sci-fi space settings and whatnot, so I figured this is right up ally. On the surface, this game looks like a standard shooter/action game. However, if you think you'll just be able to run and gun your way through, well, prepare to die a lot.Upon playing this game, you'll quickly realize the enemies don't react - and die - the way they have in the past in other standard shooter games. This is most noticeable when you start pumping round after round into the chest of some mutilated human monster coming towards you and it doesn't go down. The game has a sense of strategy in that you're supposed to shoot the limbs off enemies and then run up to them and stop their bodies into mushy blobs. Unfortunately for you, there isn't an abundant amount of ammo in the game, either. Another example I have about how this game's combat is different is from a situation I experienced in the med-lab. Of course as you enter, the lights turn off and the rotating yellow warning lights come on so you can barely see anything. And *ding* enemies appear. I was extremely low on health and had managed to kill a few baddies. There was one that was on the other side of this raised walkway I was on. Rather than charging at me, the enemy climbs into a nearby vent and came out behind me while I was distracted sorting my inventory and attacked me. I thought he was escaping before. Silly me. Something I notice people aren't talking enough about in this game is the amazing sound design. Now, I was playing the game on a legit 5.1 system, so it sounded amazing, of course. There are times when you'll walk outside in space and everything gets muted and the only thing you clearly hear is Isaac's heavy breathing inside his helmet, which sounds really crrepy. And trying figure how stuff sounds in space to record it is probably a difficult job. One gripe I had was the amount of loading that takes place after you die. I didn't time it exactly, but it was around 30 seconds. It breaks the tension a bit, I thought, and becomes incresingly annoying if you're dying a lot. As for the blood. This game has a ton of it. 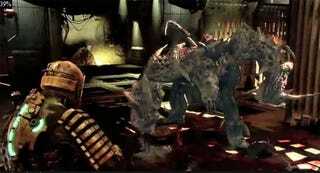 Like RE4, there are plenty of graphic death sequences that Isaac has to go through when you die. Limbs flying everywhere. Blood squirting in every direction. I'm not sure if it's the bloodiest game ever made, but I bet it's up there.